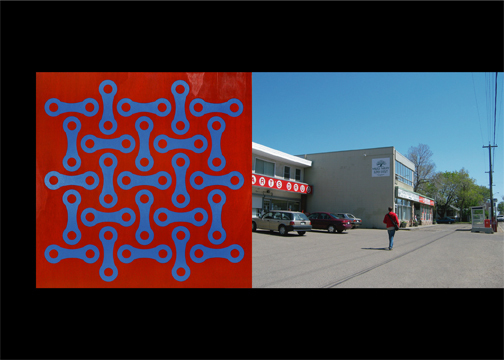 Free Rain is the title of the painting chosen by James K-M and Joe Clare to be painted 16′ x 16′ on the west wall of the commercial building at 9202 95th Avenue in Edmonton this summer. Artist James K-M stands at the location of the proposed mural, holding an image of “Free Rain” from his recent SFU catalogue. For more about Free Rain, see the Artist’s Statement here.